I really like Tolkien's poetry. He has a very good ear for rhythm and assonance. I think that the coolest thing about his made-up languages is that the words sound like actual words might. The stanza here that's entirely in elvish is still easy to read aloud because the words flow off your tongue. Another thing to notice is which sounds he chooses to use at all. You'll notice there's really no hard or sharp or hissing sounds in this poem. There are a lot of l's and n's - very fluid consonants. There are several th's, ch's and f's --which are soft and smooth. There are a couple of g's -- which are the only real stops he uses, but these are at the beginnings of words, and seem to be there to spice it up a bit. There are almost no d's, t's, k's, z's or s's at all, and the ones that are there are minimized by their placement in the word. Compare that to the ring poem: "Ash nazg durbatulûk, ash nazg gimbatul, Ash nazg thrakutulûk agh burzum-ishi krimpatul." and you'll start to see why people are so interested in the various languages he made up. I've got an audio tape of Tolkien reading some of his poems (and the "Riddles in the Dark" bit from the Hobbit). It's pretty cool. 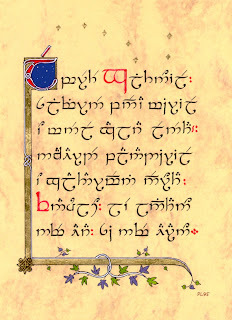 Oh, and Doug tells me that Sindarin was based on Welsh while Quenya was based on Finnish (those are the two Elvish languages), and the language in Rohan is based on Old English. But the language of Mordor doesn't seem to have any real-world analogues.